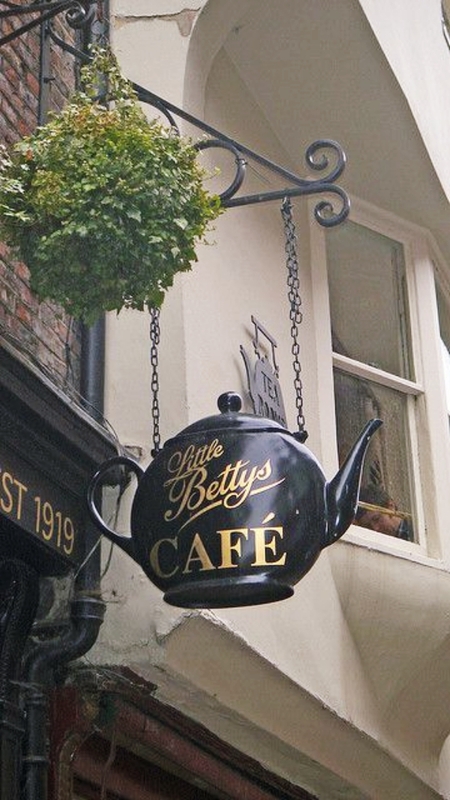 The early morning ritual begins with a hot cup of tea made and served in through a beautiful looking teapot. 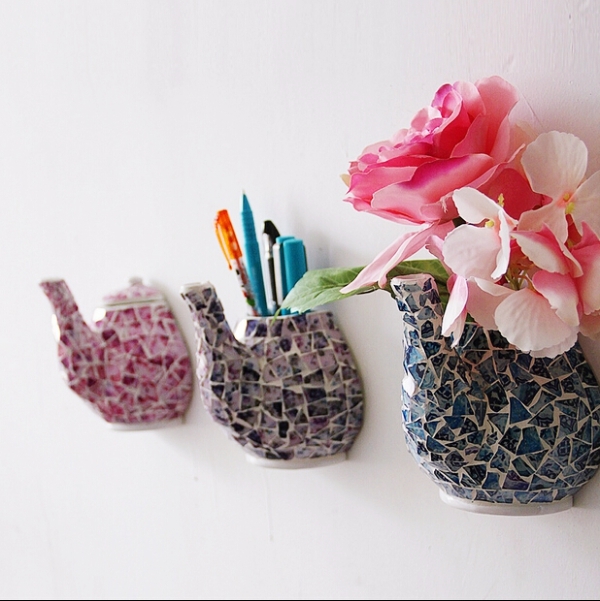 You love these pots so much that you have a bunch of them now. But, have you ever given it some creative thoughts? 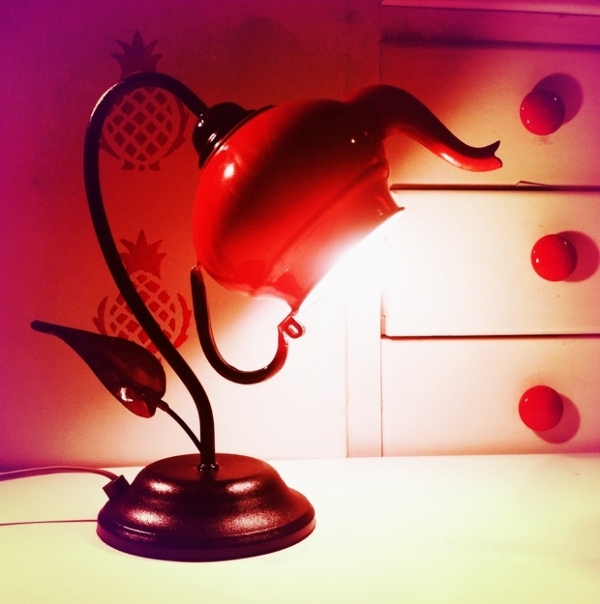 What if I told you that you could use teapots for other uses too? Wondering what those other ideas could be? Then, look around… look out of the window and stare at the beautiful garden you have… Look at the plain walls within your house. Get some hint of where I am leading too? Yes, you have caught it right my friends, because c’mon, life is too short to live it in a boring way. 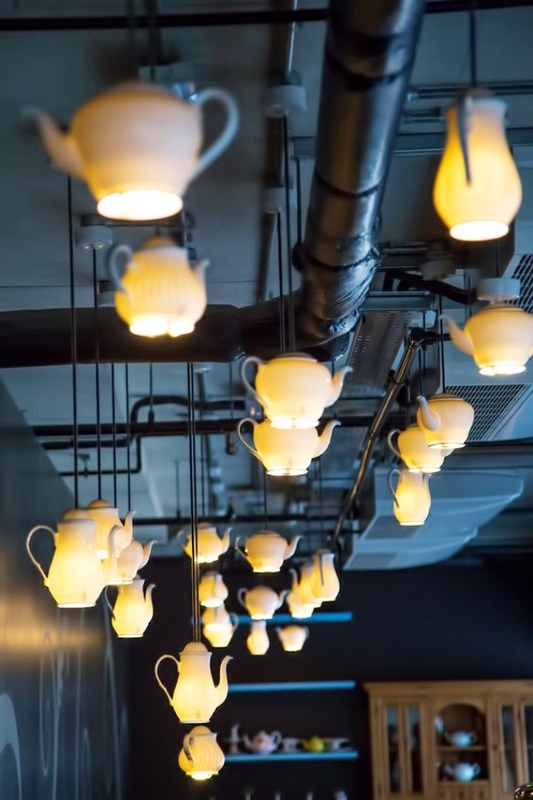 Creativity is to replace the old and boring teapots ‘cause repurposing them into Simple Yet Beautiful Hanging Teapots Decoration Ideas is the new big thing. Why use the teapot in the way it is designed for? 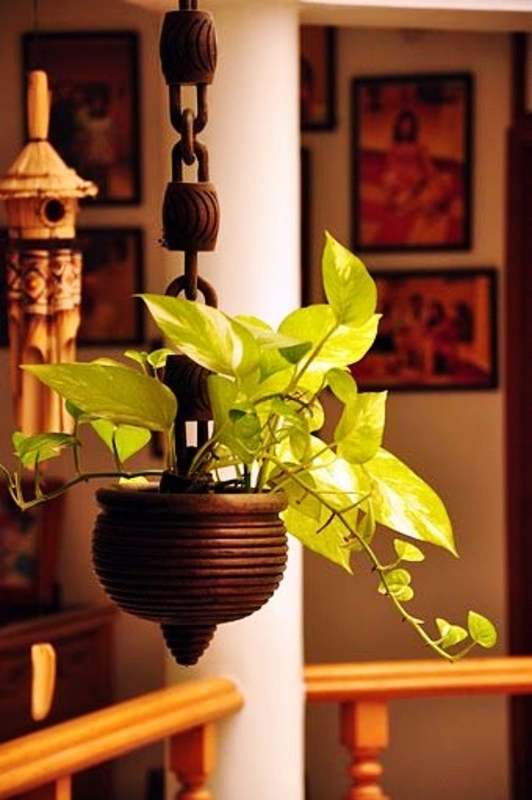 You can always use this as a flower vase – Use a strong rope to hold multiple tea pots in a row, so that it can be hung either on the walls of your house or outside in garden area. Learning about flower arrangement will only make your flower vase more beautiful and perfectly arranged. 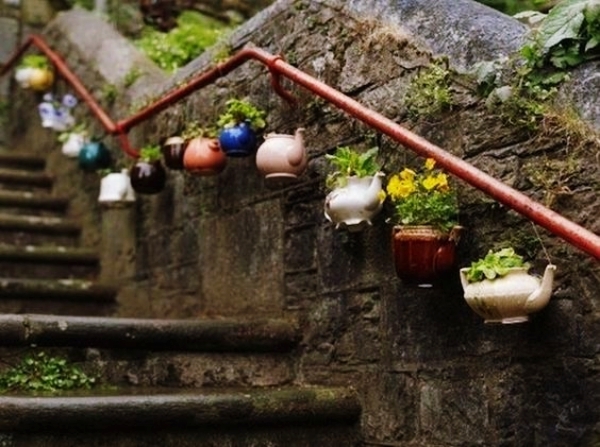 What if I told you that this amazing creativity would not only increase the style quotient of your garden, but it would also save a lot of your time in watering your plants? 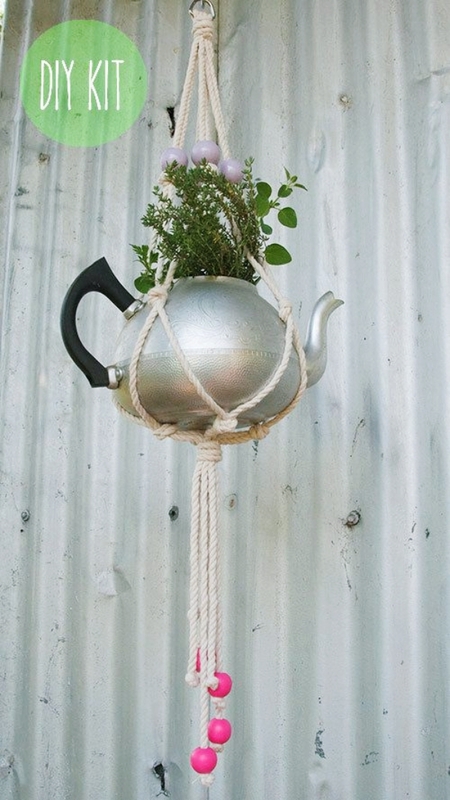 Hang it on a J-shaped bar and let the water drip out slowly on the plant beneath the teapot. Ha-ha, I know I am amazing. 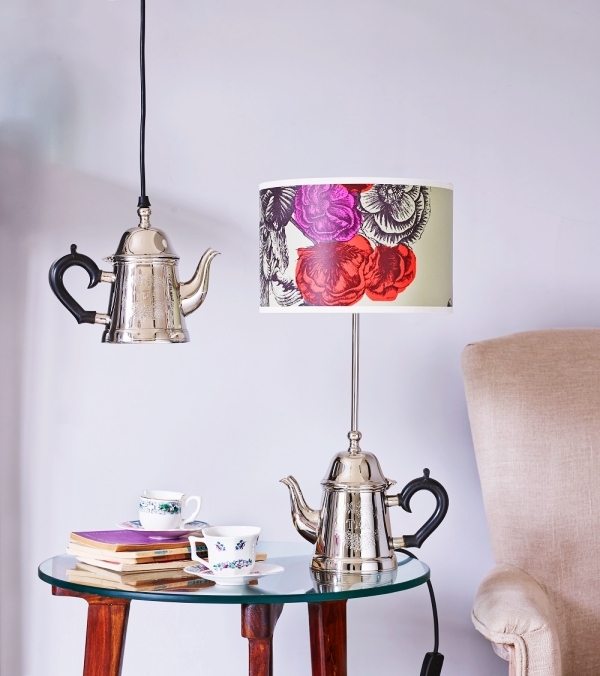 Use the teapot to another use than flower vases and garden accessories. 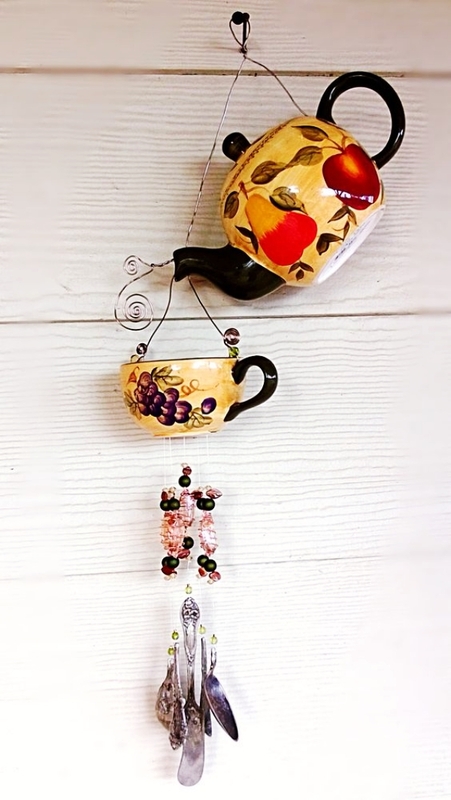 Make a hanging tea pot in your room and let your neck pieces and bracelets hang on to it. 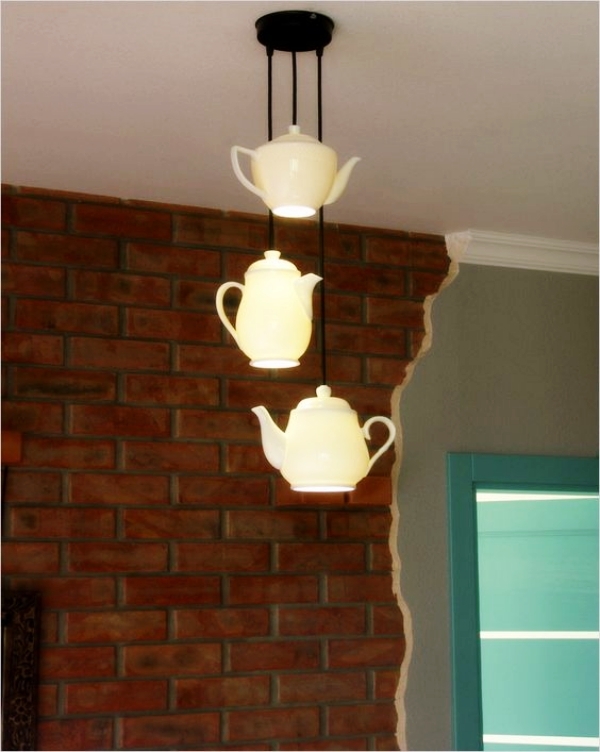 Place bulbs or lightings inside the teapot and hang them from the roof of your room. Wire them through teapot cap and hang it straight up. 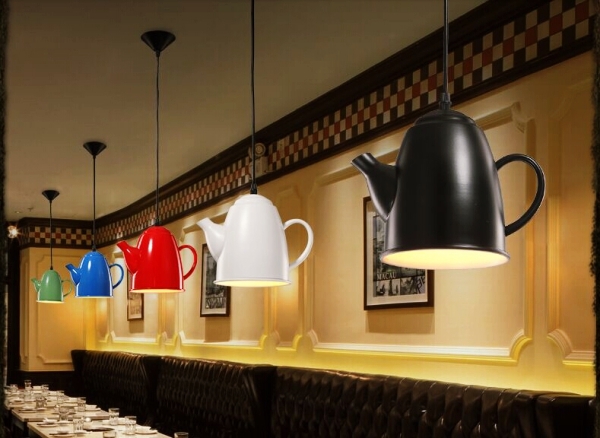 Lightings, after all, make your spaces more serene and pleasant place to be. 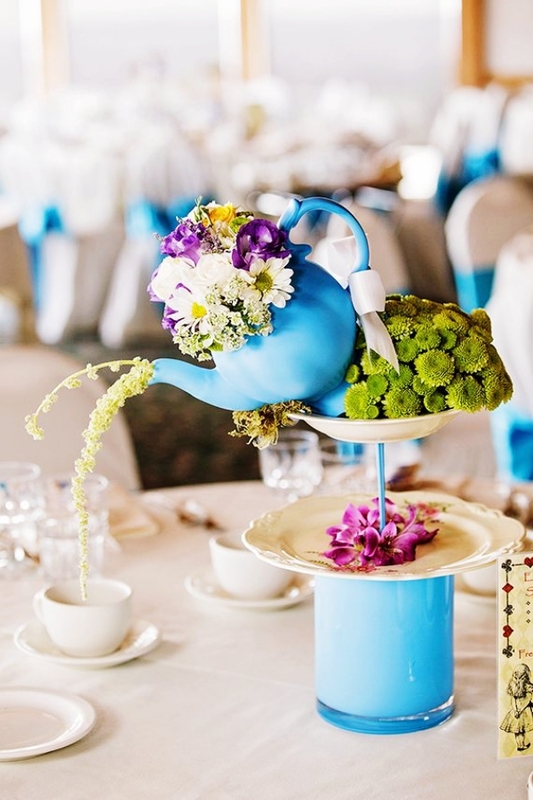 If you are looking at these cute teapots as a party decoration idea, then this one is going to serve the purpose. Tie it with ribbons and stuff lot of different colored ribbons inside the tea pot and let them ooze out from the opening. Ensure that different colors are coming out at the same time, so that it looks colorful. 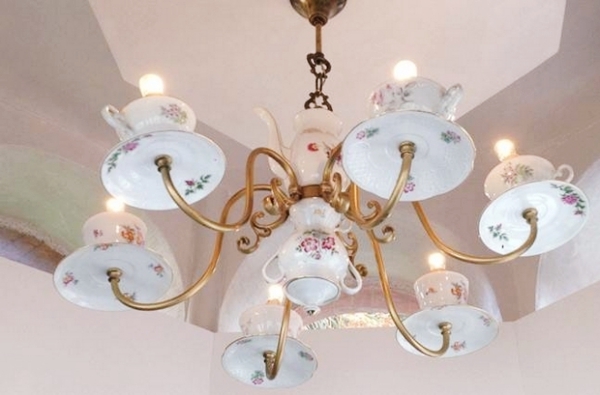 Use teapots, cups and saucers for this hanging teapot idea. 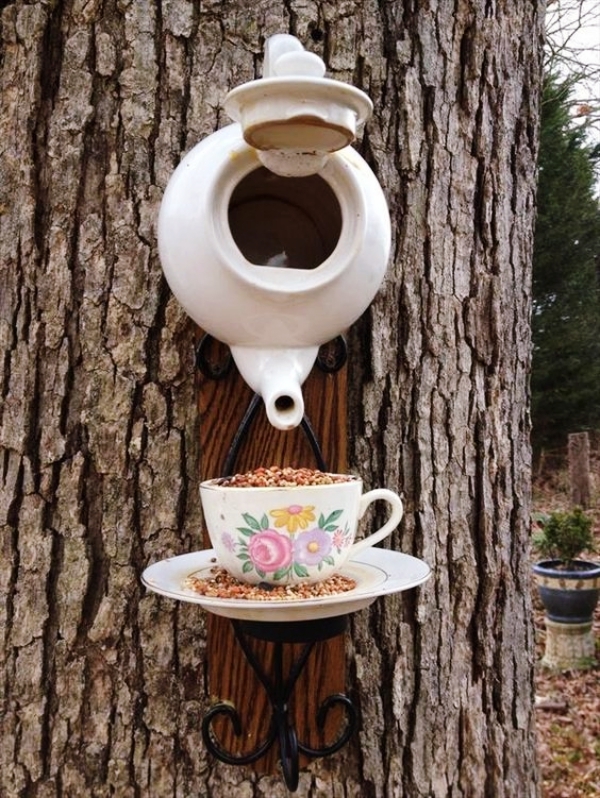 Stuff sufficient amount of bird food in the tea pot and hang it sideways on the tree of your garden. Place the cup just below the teapot in such a way that the food falls right in the cup for the birds. Can anything be more beautiful than a ringing wind chime? Now, what if it was totally handmade? 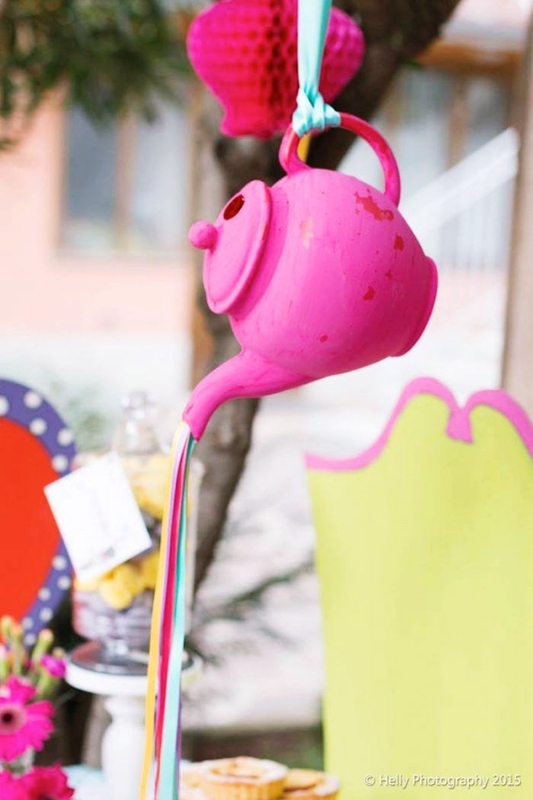 Use teapots to let the chimes hand. 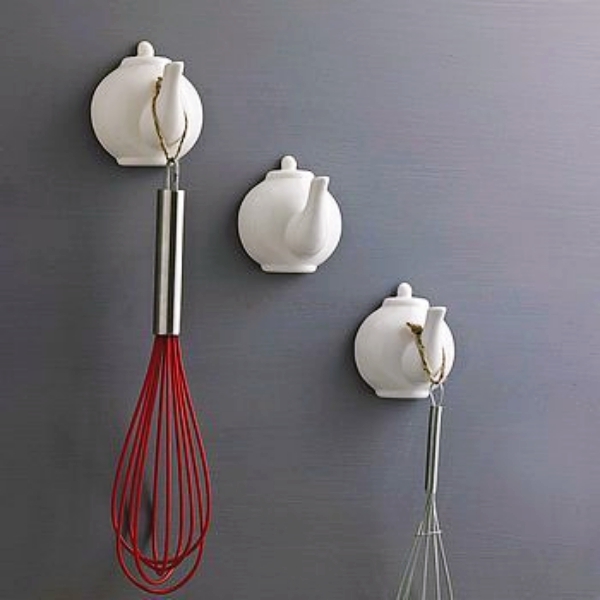 Use wires to hang the chimes to this. 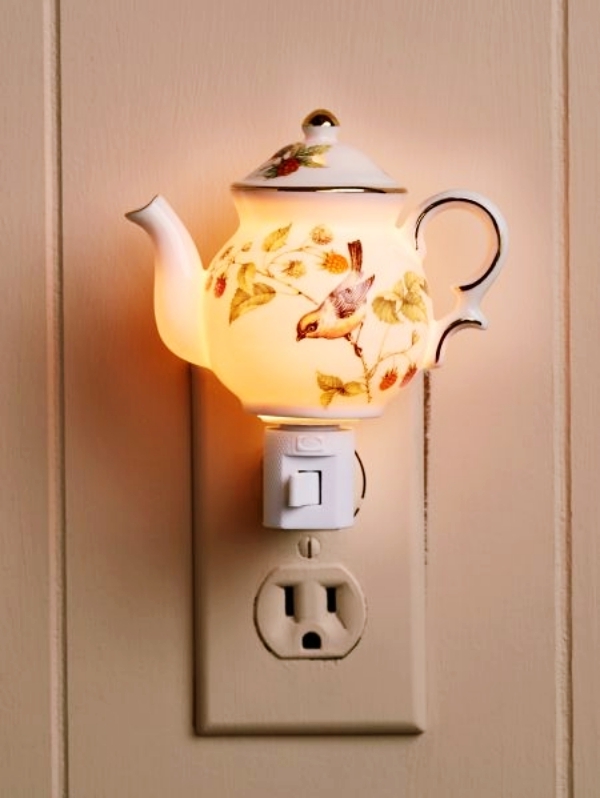 You can hide the wires inside the teapot. 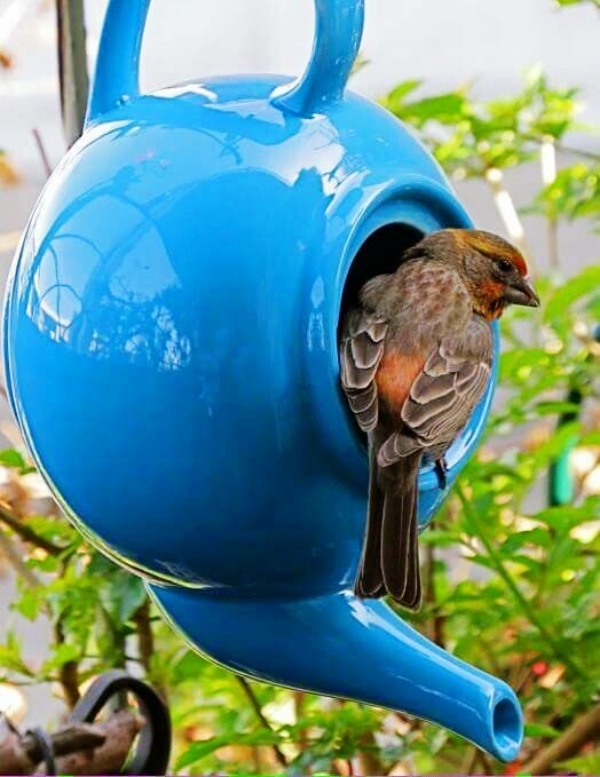 Use the opening of the teapot as the house of the bird. Hang it either straight up or sideways in your garden and leave it open always. Let the bird use it as they want. 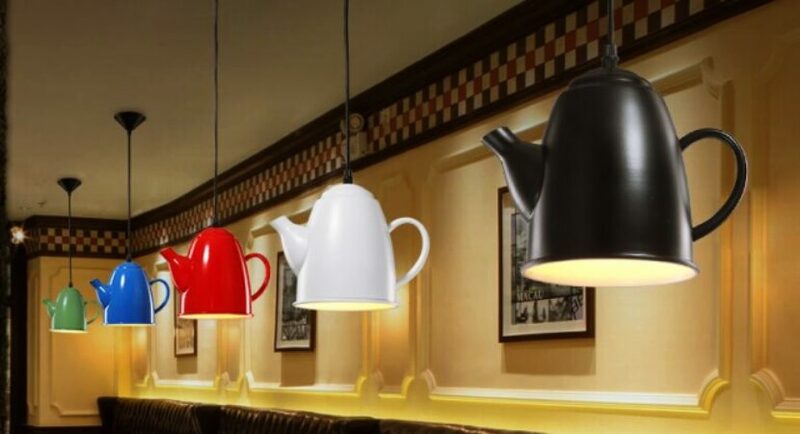 Hang the teapot sideways on the walls of your room and then use those decoration lights with it. Let half the lighting to spill out and hide the rest of the lighting inside. 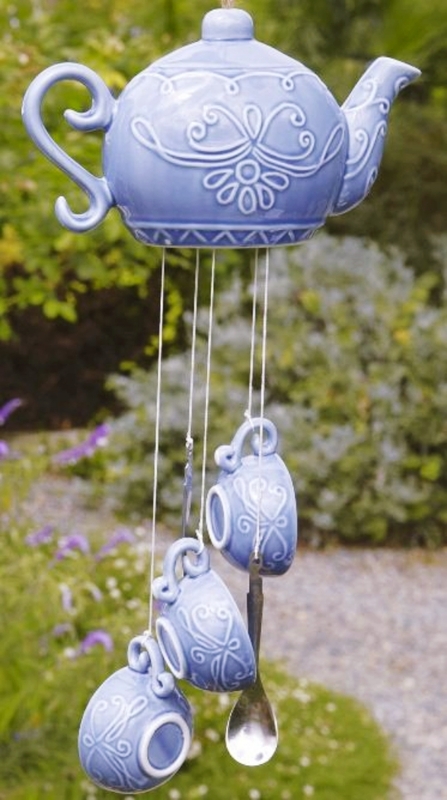 Go the extra mile with the wind chimes idea and make a whole chandelier with some tea cups, saucers and tea pots. Keep the teapot high above and then in the below, let the cups go upside down. You might not be able to make this perfectly at home, so let a professional make it, by you giving them the idea. You know the best part about these decoration ideas? You have the materials readily available with you. But, you just need to be a little careful as they are usually of glass.